Head and bow from a copper-alloy long brooch, probably a small-long but possibly a cruciform brooch. 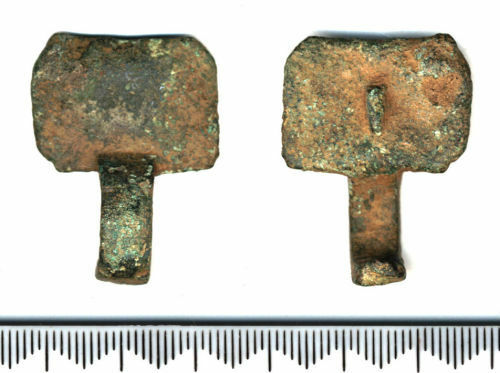 The headplate is rectangular, 25.5 x 18 mm, and although it does not have the top or side knobs characteristic of the cruciform brooch it does have a very faint hint of a flat central panel and very slightly bevelled side wings. There is no apparent stamping or any other kind of decoration, but the surface is very corroded making certainty impossible. On the reverse of the head is a single broken pin bar lug. 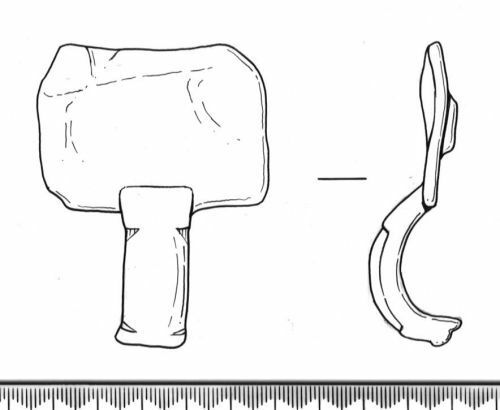 The headplate is rather lumpy, especially in the left-hand upper corner, which could be the result of slight heat-distortion, perhaps from a cremation pyre. The bow is narrow (7 mm wide) and quite steeply humped. It has a flat panel at both top and bottom, and in between is D-shaped in cross-section. The upper flat panel may have some transverse grooving and there are also hints of transverse grooving on the D-shaped part. The break at the lower end of the bow is worn and old; in fact all edges are very worn. The missing foot is crucial to deciding whether this is a cruciform or small-long brooch; the cruciform always has a variant on the horse-head terminal whereas there is more variety among the small-longs. The dates for both types is the same.